Mark is a feature story in both Landscape Hardscape Design Build and Turf magazines, and talks 2010 garden trends with reporter Marcia Duffy. 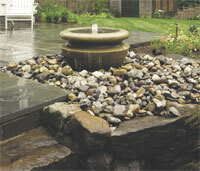 Including environmentally friendly stone and hardscape options. GardenWise, Inc. has been moving forward with “green” trends for several years, and Mark was pleased to share some easy to follow tips and ideas for home- owners across the U.S. who plan to go green with their next landscape/garden project. All pictures featured in the story are of Mark’s landscape design work in Bethesda, Maryland; Alexandria, Virginia; and in Arlington, Virginia; and were photographed by Lydia Cutter. Washington D.C. Garden Designers GardenWise, Inc. If you live in Washington, D.C., consider the different landscape and hardscape spaces you can create to occupy the space between your home and the street. In the district, front garden spaces can be a major challenge as some of our front doors can be a mere 3-5 feet from the sidewalk/street. As a native Washingtonian, I’ve faced these very challenges for many years with my own homes, and I’m here to remind you there are no limitations — only possibilities! Your front space can be a secure, lush, and green, where you can spend many hours of enjoyment throughout the year. 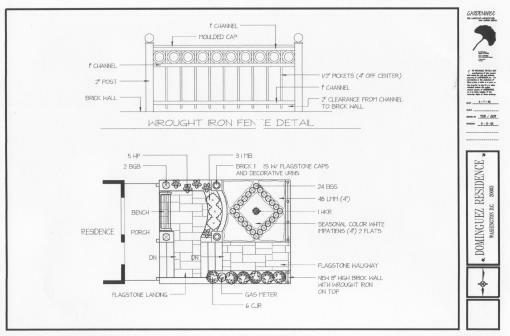 With the right design plan incorporating various hardscape elements, such as new walls, stairs, walkways, and patios, and landscape elements, including plants, shrubs, trees, flowers, and plant containers, your home will come to life before your eyes. By adding other landscape design elements such as custom iron work, new lighting, and a new front door, an unused and uninspired front yard space can be transformed into an eye-catching, lush, and sophisticated space. You’ll enjoy more of your home in a way you never dreamed was possible, and the 10-15% increase in your home’s value is an added bonus. Below are before and after pictures of a small front yard space I designed and installed on Capitol Hill. I hope you will contact GardenWise, Inc. via email or at 202-543-3422 to discover all of your possibilities! Start 2010 with J. Mark White and HGTV! Start 2010 with GardenWise, Inc. on HGTV’s signature program, Curb Appeal, on January 3 at 8AM. Watch as Mark’s exclusive for HGTV landscape, hardscape, stonework, lighting, and iron work designs transform this outdated Washington, D.C. home. Be sure to keep an eye out for the beautiful iron work Mark designed that sets this home apart from all others in this Capitol Hill neighborhood. GardenWise owns the rights to all of the design work in this episode, so feel free to ask Mark about his work from this or other episodes he appears in on HGTV. It’s important for garden lovers to prepare their flowers, trees, shrubs, and other plants for winter. To prepare for spring and summer blooming season next year, do some of the heavy lifting now! Proper fall preparation can lessen the work necessary in the spring, and will cut down on the cost considerably. It can also make your garden a year-round source of inspiration. DC GardenWise Landscaping Southern Living Style! Southern Living magazine recently traveled back to shoot two more of the GardenWIse DC Gardens. They were here last year, and one of the gardens they photographed was published over the summer. Our clients John and Jim were kind enough to open their home and garden to us, and below are some photos I took during the shoot. The editor I work with is terrific, and I have enjoyed the time I’ve worked with her. She’s a has a keen eye, and is a wonderful storyteller . Her crew is also a pleasure to work with and be around. This Logan Circle Garden is located in Northwest Washington DC, and is a welcome respite to its urban environment. The garden is Asian inspired, and includes an elevated tea house, a ‘Zen’ water feature, and a grove of bamboo. 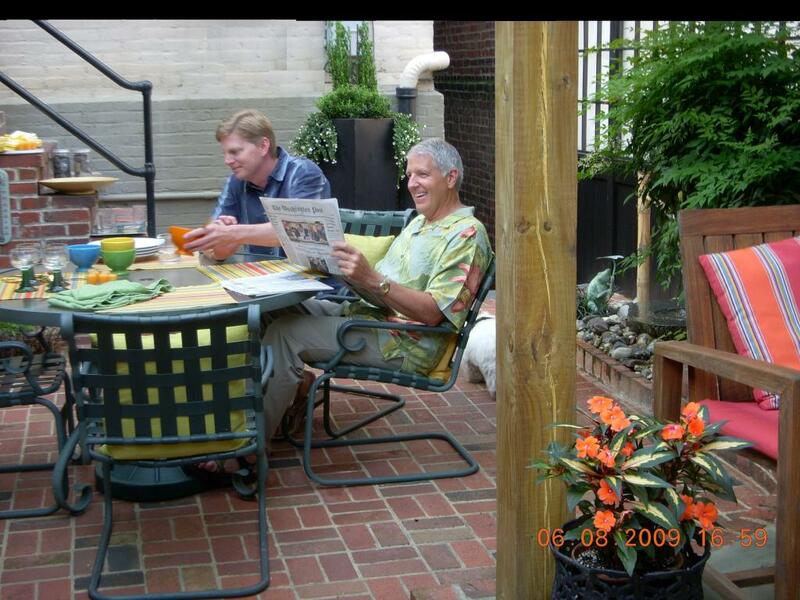 Jim, John & their two dogs enjoy relaxing in the garden and dining al fresco. 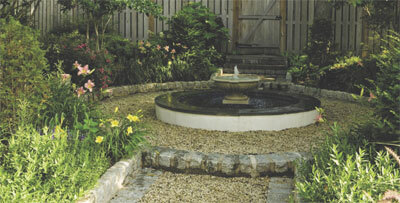 The story on this beautiful DC Garden should run in an upcoming Southern Living summer issue – – we’ll keep you posted! Home & Design features Landscape Architect J. Mark White of GardenWise, Inc. who transformed the previously ignored Georgetwon space into a Zen garden, another bridge to Morris’s fascination with the East and an extension of the home’s interior. She enjoys meals at a table under a bamboo-topped pergola, which canopies a mother-of-pearl lantern, while an oversized ceramic vase turned into a gurgling fountain encourages visitors to just sit and relax. White also combined plants typical of the traditional English garden – such as the climbing rose on the arbor – with elements of the Japanese style garden, including the pergola made of stone and cedar and topped with bamboo.